Home Blog What Is the Typical German Home Like? Before you begin working your way to foreign language fluency, it helps to understand the culture behind the language you’re learning. After all, language exists to help a group of people express their ideas and beliefs. Germany is an old country with a rich history and culture. As you begin your German language program, gaining a strong grasp on this history, the values, and the etiquette will help you rapidly achieve success. In particular, German housing is very different from U.S. housing in a lot of ways. From apartments to houses to the very furnishing inside, know what to expect before visiting a German home. Apartments in Germany are not furnished with appliances, so if you are relocating with your appliances, keep in mind that there are differences in the electrical system. Germany uses the metric system. Appliances manufactured in America and Great Britain will not work in Germany without adaptors and expensive, sometimes unwieldly transformers, as the voltage is different. German voltage is 220 to 240 volts and American appliances are made for 110 volts. German outlets are also shaped differently, made to fit a round shape. The plugs have two prongs and utilize 230 volts with 50 hertz. There are some electronic products that are now being made multi voltage, like computers, razors, video cameras, and irons. Many items and furnishings in Germany also have different sizes and specifications, and the spacing in apartments are also dissimilar. For example, an average size dining room table may not fit in the space allotted in your place in Germany. To avoid damage to your appliances or a potentially dangerous situation, its best to purchase German made appliances and resell them if and when you move out of the country. Televisions made in America will not work in Germany, or anywhere in Europe for that matter. The British televisions will work in Germany, but only after adjustments, and there’s also the issue with the plug. Germany uses PAL B system televisions. If you’re bringing a collection of DVDs, they will need a chip installed as they won’t play in a European machine. Computers usually need only an adaptor. Rental apartments in Germany bring new meaning to the term “unfurnished.” Not only are they completely bare as far as furniture and appliances, but there’s no cabinets in the kitchen, appliances, closet area, or “fittings” for light fixtures. You may get lucky and find a stove, but refrigerators are usually not provided. The upside is the apartment will be immaculate, and everything such as central heating and water will be in good working condition upon moving in. Furnished apartments are hard to find and cost a lot more. The upfront costs of securing an apartment in Germany can be complicated and expensive and it’s advisable to seek legal counsel to review your lease before signing it, as the terminology and legal terms may be confusing. The initial deposit for the apartment is normally two to three months’ rent, so you’re looking at a total of four months’ rent to move in. The quickest way to find a place is through a real estate agent, but they will require three months’ rent in advance; that’s in addition to your security deposit. They will take care of everything, including legalities. You can also check the newspaper listings or search rental websites on the internet. Germany boasts a host of great accommodations around the country. Even the simplest of accommodations are characteristically efficient and clean with hot showers that work. This is owed to the German culture that always demands quality and efficiency in all forms of services. Five grades or stars usually categorize German hotels, with each grade representing specific types of facilities. Hotels, which are identified as “Gasthaus” in Germany, are quite expensive. However, “Hotels garnis” (small hotels that offer breakfast but without regular restaurant business) and bars/inns with rooms (“Gasthöfe”) provide cheaper options. “Pensionen” come in at even lower prices and offer a minimal breakfast. They are usually run by families, making them an interesting option and are prevalent in smaller towns alongside inns. If you are trying to find accommodation in Germany, always look out for a sign that says “Zimmer Frei”, which translates to mean “rooms available” in English. Then there are “Fremdenzimmer:” stepping down from a pension or inn, there are private rooms that can be provided by the houses of the locals. Prices of these private rooms are quite cheap and rarely exceed 30 Euros. If you are not into the intimacy that comes from such options, you can look for other options being advertised or utilize tourist information offices to book rooms. German downtown apartments may be a little bit smaller than their American or British counterparts. Most will have a dining corner in the kitchen for family or intimate meals, and then a dining area in the sitting room for guest meals or entertainment, and the rooms may be smaller and more compact. Houses will, of course, have significantly larger (and more numerous) rooms. Some of the traditional nineteenth- and early twentieth-century apartments, houses, and chalet-style houses found in Bavaria and other parts of Germany can be very spacious, indeed. However, for those who have chosen to forgo house hunting in favor of the apartment lifestyle may find that the lack of space restricts certain aspects of day-to-day life. It is important that the hallways are kept clear, with bicycles and other modes of transportation stored inside the apartment. New residents should invite their neighbors to visit if possible, but not to the point of appearing intrusive—politeness to neighbors is to be expected, but closeness is not. Germany has many private rooms, youth hostels, and apartments with kitchenettes. Local tourist offices, which are usually based on main train stations (“Bahnhof”), come in handy when you are searching for such facilities that meet your needs. You can alternatively consult the Michelin Green Online Guide at Michelin Travel. Airbnb also brings other options to the table. The service provides private accommodation in residential homes of homeowners who collaborate with Airbnb. This service can easily be accessed through its website or a smartphone application. Germans are known to be great travelers, and because of this, there are thousands of campsites set aside for caravans and tents. There is also one of the widest network of youth hostels in Europe available in the country. Rules and opening times of these facilities usually vary, but general information concerning them can be found at the German Camping Club (DCC) or the German National Tourist Office. The German Youth Hostel Association (DJH, Deutsches Jugendherbergswerk) operates the youth hostels. You need to be registered as a member of IYHA (International Youth Hostel Association) to access the youth hostels. Germany also has specialized hotels that cater for traveling bikers. First timers are given a pass that allows them to have a free night on the tenth visit. Home ownership is less common in Germany than it is in other parts of the Western world. About 43% of Germans own their homes, as opposed to 62% in the US and 65% in the UK. Most Germans rent, and spend 25-33% of their net income on housing and accommodation. Tenants enjoy considerable legal protection, and, as a result, landlords may come across as somewhat choosy about tenants they are willing to accept. 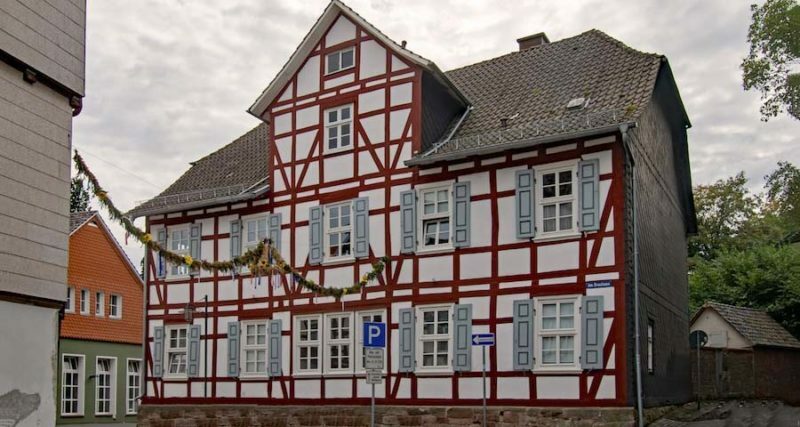 German houses and apartments are always well-maintained, and Germans are very house proud, a fact that extends beyond the house or apartment itself and into the surrounding area. By law, German homeowners are required to keep the sidewalks in front of their residence swept and free of snow, and for apartment buildings a rotation schedule may be set up in order to ensure that this requirement is met. This sense of community also extends to a variety of household tasks—specifically, to the use of communal laundry facilities. In many apartment blocks, communal washing machines and dryers are kept in the basement, and access to these machines is regulated by another rotation system. More residents are choosing to install their own personal equipment, but those who decline to do so should be prepared to have to negotiate for time, or for use of the machines outside a carefully regulated timeframe.